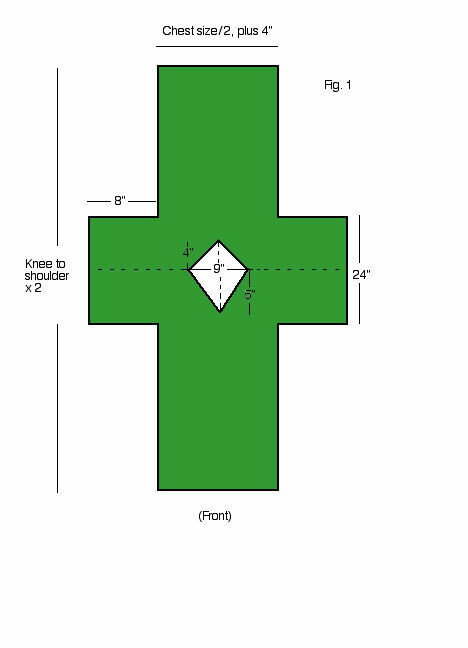 1) Cut a piece of fabric to the dimensions shown in figure 1. 2) Fold fabric on the dotted line so it looks like the image in figure 2. Make sure if there is a “good face” of the fabric(the one you want to show on the outside when you’re done) that it is on the the INSIDE of the fold. Faces should be good side to good side. The “rough side” should be showing to you right now. 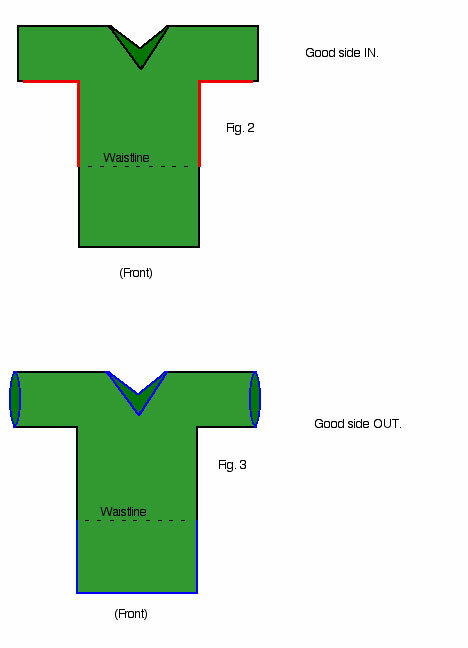 3) Sew the fabric together in places indicated by the RED edges in figure 2. Black edges leave open. Notice do not sew flush to the edges of the sleeves. Leave an inch or so to bring in a hem later. Do not sew past your waistline or you will have more of a dress than a tunic. Be sure to reinforce with a zig zag or double stich. 4) Once you’ve sewn and reinforced, flip your tunic inside out so the “good side” shows. Hem your tunic as indicated by BLUE edges. 5) Strut around in your new tunic. If made correctly it should be baggy and easy to move in.